Educate yourself with on the benefits of essential oils. Here you can find information on the physical and emotional benefits of each individual essential oil along with current research. The How to Use Essential Oil section highlights common application methods and uses for individual oils. 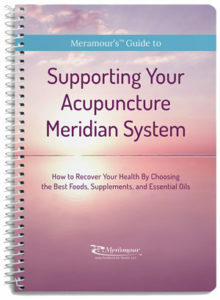 Meramour’s Guide to Supporting Your Immune System is for the health-care provider and the those interested in learn the Body-Feedback self-care techniques. Higher Vibrational Living is perfect for anyone looking to better understand their astrology chart. With the combination of essential oils and Chinese medicine, you can enhance beneficial aspects and soften challenging aspects in your chart. Michelle Meramour has two options for continuing education for the healthcare provider. (was Buchanan) has been working exclusively with ELotus.org to provide online education for practitioners at this time. There are a variety of approved continuing education classes offered through ELotus.